Alright, so this review is for all of the parents who want to get this game for their kid, or their kid has been begging for it forever, and you are reading reviews to see if you should buy it. So, first of all, the game is not educational. If that is the main reason you were going to get this game, or the main statement your kid made up to get you to buy it, stop reading this review. Second, you might want to turn on parental controls. With parental controls, you can do things such as enabling only featured levels. 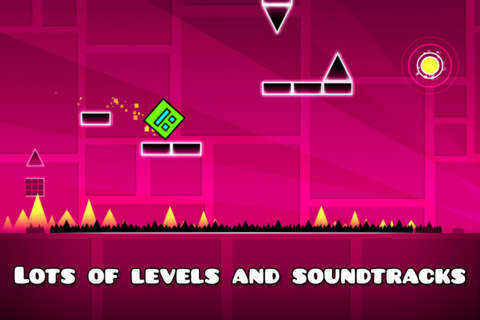 Some of the non featured levels can be REALLY inappropriate for kids, some are even bad for teens. Featured levels are all good for kids, and have no languages, but the songs might have one. You might also want to turn off comments, because there is no filter, so you can type whatever you want, so there could be some bad things. Same thing goes for messages, so turn those off. However, once they turn 10 you should disable all of the parental controls, because they should know what is bad by then, and you can report levels. So yeah, that is my review. I hope I cleared up some info for you, and you made your decision. But that's fine if you didn't. -The GD user I Like Memes. So my old review is below. I’m writing this because I’m the new update I have been getting a glitch where when I click on a level at the beginning it shows your attempts like attempt 4 then attempt 5 etc. But some reason that has flipped upside down so it says Attempt X upside down. Idk why or if anyone else is experiencing this. Pls fix Buy this game right now it's really fun and addicting. There is lots to do like play other user levels and make your own levels. There also is plenty of icons to unlock and lots of soundtrack it's worth the two dollars trust me! It also has lots of fun things to do when your board like hidden treasures to find! There arnet any major glitches a few small ones but the small ones are hard to find but they are very fun like the flip glitch where you can put things together and make Your rocket flip very happy basically the only game I play on this! So, I’ve been playing this game since 2015. I’d say I’m pretty good. 120 demons beaten by the time of writing this (my account is called Kkbleeblob). I’ve got 5000 stars and 1000 user coins. For all you parents, this game is not educational and is completely made for fun. Don’t go calling this a piece of crap just because you’re bad at it or you have such a bad device stereo madness lags for you. This game has an entire COMMUNITY. If you know all the aspects to this game, you can find it really fun and entertaining. Just one thing: I don’t want this game to turn into just another platforming game where you go left, right up and down. In 2.2, robtop seems to be taking the path of going back and forwards more, which I think might ruin the game if he goes too overboard. Also, I hope he doesn’t add the random trigger, because this is a skill based game, not a luck based game. You probably haven’t read this much, but if you have, hope you take this into consideration. The game is awesome, I love getting new updates. I love playing the levels created. Its an all around awesome game. I’m glad to have been part of it for a long time. But theres one thing that I have thought about and would love to see in the game. When trying a level over and over again to beat it, you have the retry pop-up (if its enabled) it shows jumps, time, and attempt number. But I think if it included your best attempt on the level. That way you can see how far you have gone in the level, instead of having to exit out of the level to see it. Its a small change and I doubt it would hurt a lot (if any) in the game. Other than that Thank You for the awesome game!! I love this game to death, but I still have 2 problems. 1 is that I needed to log back in and had to change my password because I forgot it. But now I can't view a single persons account which irritates me because I have to search up the level of a creator instead of going to their account. And 2, lag has gotten worse, whenever I go into a object heavy level it crashes on my iPad mini which is very irritating I get that it will lag but crashing is unacceptable. I really hope you fix Rob! I don't wanna quit this game soon from a bug! Now I know what you’re thinking, This game is so hard! But patience is a virtue and it takes time and effort to get pretty good at it (coming from a player who has played for quite a while) Plus the levels and the music is amazing. I could literally listen to Clutterfunk forever, some things I would like to suggest in the next update is a collaboration mode, yes it is possible to collaborate in the game but it is pretty complex, so a collaboration mode would be nice. Also I love 2.11 , there are some bugs but other than that is amazing! 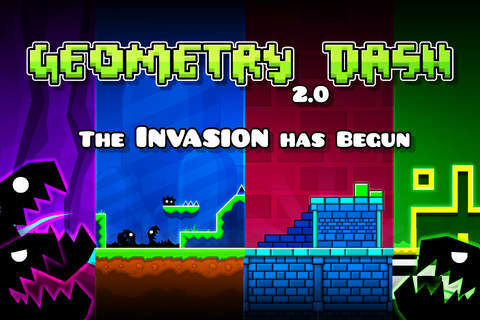 I cannot wait for 2.2 and the continuation of the story of geometry dash. If RobTop is reading this, keep up the good work with your awesome game! I've been playing this game for almost 2 years, and I've enjoyed almost every moment. This game is super fun, and it's insanely hard. There are 21 main levels that you can play by tapping the play button in the middle of the main menu. 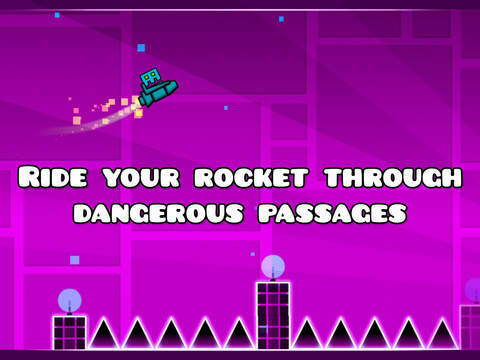 These levels are made by the game's developer (RobTop) and all of them have different gameplay and vary in difficulty. Tapping the square on the main menu will lead you to the character select screen, where you can unlock lots of different icons, ships, UFO's and more to use in levels. If you tap the hammer/wrench button on the main menu, you'll enter the level editor. Here, you can make your own levels and post them online. However, the level editor is really hard to figure out how to use, so good luck trying to make a decent level. This game has loads of community-made content, and some levels posted are completely mind-blowing. Unfortunately, this game's community is really bad. You may be wondering, "How can a game about squares and triangles have a terrible community"? Well, get involved in the community, and you'll find out. Also, there are a few bugs in this game, but they can be avoided pretty easily. RobTop is currently working on a bugfix update which also adds some new icons, so these bugs will be deleted fairly soon. Overall, if you like rage games that constantly make you feel frustrated, you will like this game.